COPPER GLEAM™ HS-201 is a full bright acid copper plating process specifically formulated for use in conveyorized plating equipment with insoluble anode. Formulated for high current density plating, the process is capable of producing uniform, bright deposits of high ductility and tensile strength in accelerated plating times. 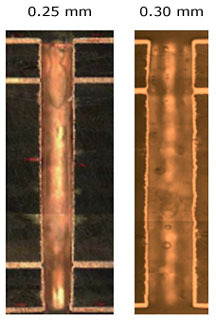 Building conductors on printed circuit boards requires acid copper electrolytes and organic additives tuned to the specific requirements of the board design. Dow Electronic Materials provides an extensive range of processes to meet the requirements for panel or pattern plating; flex or rigid; thick or thin panels and for conformal plating or copper filling technology.